Reach out to us with any questions and/or suggestions you might have. Good Hotel London is a floating platform introducing the profit for non-profit business model into the London hotel scene. Located in the Royal Victoria Docks, offering good views over the city of London and river Thames. Good Hotel connects you with the destination, offers a premium hotel experience and the opportunity to do something back for the local community while travelling. The place where you kick off your shoes, put your feet up, enjoy an espresso, meet with friends, or get some work done at one of our communal tables. It's cozy in some places, airy in others. The food is finger-licking good and the beers are locally brewed. Freelance workaholics, foodies, world-travellers, live bands, magazine maniacs and true Londoners – they all gather here. The rooftop terrace is an oasis of green and open space, overlooking London and the river Thames. The Roof boasts unique views overlooking London & the river Thames, and is a true oasis in the city. Get a good start of the day with our continental breakfast buffet. Served daily in our Living Room. For those in a rush, ask the team for our to-go options too. Locally inspired cuisine with an international twist. The tapas menu gives away the nationality of our chef. Think locally sourced comfort food, healthy salads and good looking sweets. Shop | sandwiches, salads, cake and other goodness is available in our shop around the clock. Just in case. Enjoy drinks and café classics in an open space overlooking the river Thames and city of London. One of a kind. *Seasonal closure during Autumn and Winter months. If in doubt: please call us on +44 (0)20 3637 7401 to check if we're open, or check our Facebook page for the latest updates. 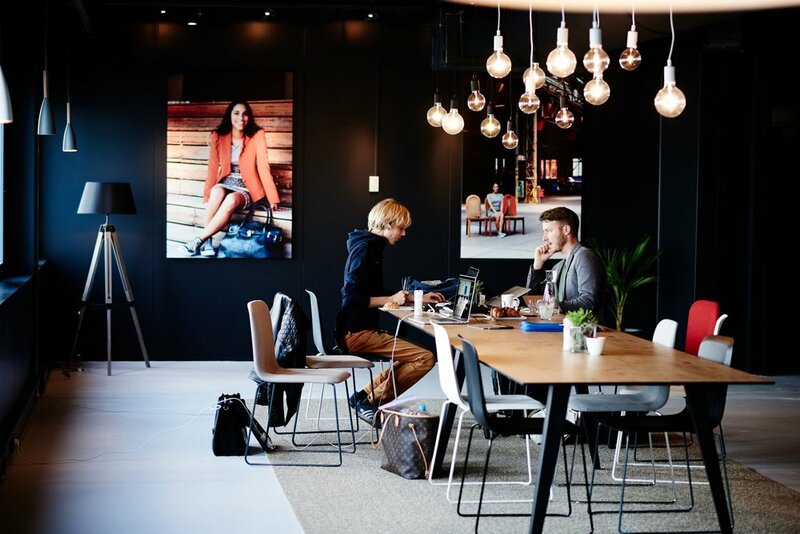 For those young entrepreneurs, start-ups and creatives on a mission in search of a place to make them feel inspired and create beauty – we have plenty of light, space and free WiFi to do exactly that. Yes, free WiFi. Everywhere. Host your next meeting or event at a unique floating hotel and impress your colleagues knowing that your event directly contributes to our social impact mission – all our profits go to providing education and training to people who need it. We have small to extra-large private spaces, perfect for a wide range of event styles. All our spaces are minimalist industrial-chic design, offer beautiful riverside views, natural daylight and good daily delegate packages. Our XL space boasts an in-room pantry and holds up to 60 persons theatre-style. During the warmer months, our stunning rooftop bar and terrace is available for private hire, and our open-plan Living Room hosts up to 120 cocktail style - we can even arrange for your own ‘pop-up’ bar in the space. From private boardroom meetings to product launches, intimate concerts and all-night parties – our planners are on stand-by to customise your upcoming event. We like being creative – tell us your vision and we’ll try our best to make it happen.